“At this golf course you just may be disturbing the crops, instead of sand traps if you knock a ball out of bounds. Irie Fields, a vacation destination in the Caribbean at Kittitian Hill on St. Kitts Island, is known as the “most edible golf course in the world,” said Joanna Fantozz, an Associate Editor with The Daily Meal. She says the 400-acre, resort’s 18-hole golf course seamlessly blends into 70 acres of sustainable, organic farmland, where tropical fruit will be grown. In addition, the golf course itself will be completely organically-maintained. “Irie Fields is one of a handful of organic golf courses in the world, and it’s also considered to be one of the most edible in the world,” a representative from Kittitian Hill told The Daily Meal. The golf course was designed by pro-golfer and course designer Ian Woosnam in collaboration with European Golf Design. So, the question is, can you pick some delicious fruit while waiting for your golf partner to finish their turn? According to the website, caddies will be on-hand to give tips for finding and picking the ripest fruit like juicy local mangoes, on the course. It was announced Wednesday that Kittitian Hill will open during a ceremony on Thursday 10th July 2014. 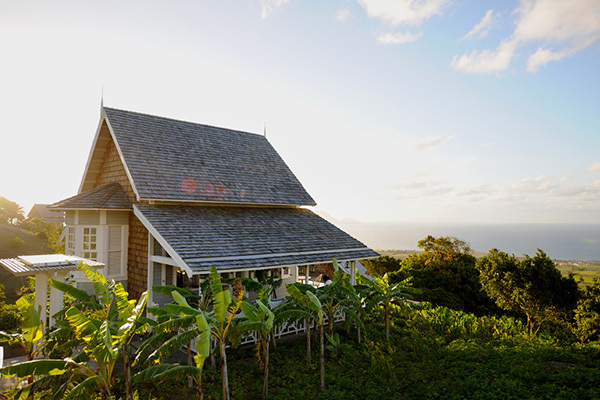 The opening will mark the culmination of three years of construction by a team of over 400 Kittitian craftsmen to create this new sustainable luxury destination, covering 400 acres on the slopes of Mount Liamuiga at the northern tip of St. Kitts. Following the official opening ceremony, the Great House and the first Guesthouses at Belle Mont Farm, the luxury cottage hotel, will be available to welcome guests. Visitors will also be able to savour the magnificent views over a meal at The Kitchen restaurant, share a drink at The Mill, the intimate bar adjacent to the restaurant, or be one of the first to experience the driving range at the Irie Fields golf course. Further Guesthouses will open over the summer, so that all 84 individual units at Belle Mont Farm will be open by 1st November 2014, along with the first villas, beach bar and full Irie Fields 18-hole championship golf course. Meanwhile work continues on other parts of Kittitian Hill including The Golden Lemon, Mango Walk Spa, and The Village Inn. All are due to open in 2015.